In the analysis of point patterns, a first-order process is one that produces a variation in point density in response to some causal variable. For example, the density of cases of malaria echoes the density of particular species of mosquito, which in turn reflects the abundance of warm stagnant water for breeding. Because both mosquitoes and people move around, the pattern of malaria density can be expected to be smoother than the patterns of either mosquito density or stagnant-water abundance. A second-order process results from interactions, when the presence of one point makes others more likely in the immediate vicinity. Patterns of contagious disease reflect second-order processes, when the disease is passed from an initial carrier to family members, co-workers, sexual partners, and others who come into contact with infectious carriers. The result will be a pattern that clusters around carriers (Figure 2‑11B and D, below). Both first- and second-order processes produce clustering and smooth variations in density, but the mechanisms involved and the relationships to other variables are very different. Competition for space provides a familiar example of a form of second-order process that results in an exception to Tobler’s First Law. The presence of a shopping center in an area generally discourages other shopping centers from locating nearby, particularly when the focus is on convenience goods and services. It is unusual, for example, to find two supermarkets next to each other, or two outlets of the same fast-food chain. 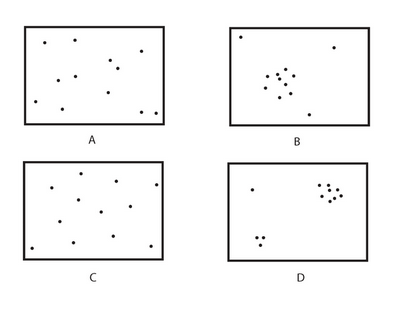 These are examples of dispersed rather than clustered point patterns (Figure 2‑11C), in which the presence of one point makes others less rather than more likely in the immediate vicinity.